Combining "OU* VOICE" and "FEDERATION REPORTER"
They are: Mrs. Howard Kay (Detra), vice president; Mrs.
people is a continuing effort." by the positive response to date. feaivus(Anne), associate Campaign chairman; Mrs. Robert E.
iBarrish' (Esther), vice president for Century Village; Mrs.
IWilensky (Ruth), vice president for Lands of the President. Mrs. Richard Shugarman (Rhona); Chairman $365 -1999, Mrs.
(Carole); Cochairman Hi-Rise, Mrs. Hilton Leibow (Shirley). Chairman, Speakers Bureau, Mrs. Charles Jacobson (Naomi). Penny), Mrs. Bennet Conn (Jan), Mrs. Bruce Daniels (Diana). [Mrs. Thomas Davidoff (Sheryl), Mrs. Albert Fier (Millie). Mrs.
and feels what we here feel." 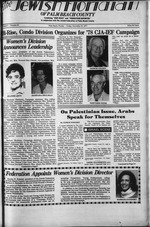 Barbara A. Satinaky as director of the Women s Division. | the past two years, she was responsible for thejW""
the largest regional membership in the country. KOACH, one of the most successful UJA missions. guest speaker for the afternoon. of Philip Goldstein will perform. of 1975 as a Conservative temple. Rebecca Dubin or Gladys Iscoe. Eve Morton or Bertha Heitner. Anita Siegel or Sheila Lewis. Dec. 15, at 1 p.m.
Group led by Fanny Ushkow. Breakers Hotel on Jan. 24.
kah Happening on Tuesday. Dec. The next meeting of the Mm'. yen's Zionist Organization Of Amen? Staci Lesser, first president of Bat Gurion Hadassah. ivioskowitz, Bocknek, associate editor; witz, Bessie Hoffman, Jack Hyman Kron and H. Irwin Levy. i'i Chib of 350 members. SUNDAY, NOV. 20th 1-5 P.M.
MILITARY TRAIL AT BURNS RD. UNUSUAL ARRAT OF ISRAELI IMPORTS. Inn, West Palm Beach, at 8 p.m. I. Goldberg, West Palm Beach. |w us today for a free termite inspection. president; and Jack Bocknek, associate editor. the supervision of Rabbi Harry Z.
the hours of 9 a.m. and noon. AHecnooo Program: 12 noon3 p.m.
savings of $25 par semester). My $40 00 non-rafuadabta application la* la ancloaad. already exist and what their limitations are." as they seem in the U.S.
to the cost of living. Public R eta t Ions. for not bending to their will. old charge of "dual loyalty." like mentality, being one myself. mother year to make reforms. the conditions of workers "
to take into account the U.S. Photos should be 6"x 7". tion, New York, N.Y. J.T. will do so at their own expense. smoking. To me, its a pleasure. FILTER: 10 mg "m". 0.7 mg mcotme. MENTHOL 11 nig. "!tf~. 0.7 mg. nicotme. av pi cigantM. FTC Riport DEC 76; FILTER 100s 11 mg. "tai". 0 9 mg nicotine av per ciganne by FTC method. Nicholas Fenakel (Molly). Mrs. Steve Gordon (Trudy). Mrs.
Samuel J. Katz (Florence), Mrs. Frank Kessler (Renee Mrs.
(Harriet), Mrs. Louis Silberg (Ilene), Mrs. Philip Siskin (Beth . (Esther), and Mrs. Neil Waltzer (Judy). overall campaign, which is way above the national average. lives and improving the quality of living for Jews everywhere. Personally, I can't think of a more noble effort." to La Guardia starting December 13th. seats than any other airline. Newark, or the newest, brightest facility in New York. that's as warm and friendly as the Palm Beach sun itself. in Israel and Around the World." Call CHUCK for prompt fast service! and Rabbi Simcha Freedman. N.D.V.H. S1 billion dollars in a variety of Israeli industries. interest earnings always in US dollars. on the Sabbath. Fun Hotel Facilities 4 Activities. including Our Famous SALAD A Q Crt **u"
Sunday, Dec. 4 at 4:30 p.m.
coming to Palm Beach in 1956.
all over the world in the U.S.
UMT 2 PW it LIMITED TIHCIFFI! "denied" by the Israeli Embassy. U.S. officials and two former U.S.
prising 65 families moved into the Beth El army camp north! northwest of Ramallah on the West Bank. Kosher Butcher Shops, Food Stores and Dellys, coast-to-coast. i the safety of civil aviation. nda on July 3 and 4, 1976.
ger person would ignore that"
pared to cope with it. this as a personality type. located at 2411 Oheechobee Blvd. of God ascending and descending on it" (Gen. 28.12). serve God there when he returned to his father's house. The Lord would be his God. for his second wife, Rachel, and six years for the sheep. his father's house. On the way he met the angels of God. bonus of free tuition for one or two years of study in Israel. Choose from 140 Universities, Technical schools, and Yashiwot. as the Fall of 1979. C Ctimil Too* Conxxaiinn l"
those of the U.S. With the U.S.
lican Minority Leader, called on . Please send me a descriptive brochure. higher than the ten million Guilders eventually paid. acres and acres of parks and picnic! available at 8'4r/ over 25 years. A Rec Lease? Who needs ft.
Another fine community by Nationwide Building & Development, Ltd.
a ill grades can regiaUr. i Mondays at 4 p.m. Breakers is scheduled for Nov.
day, Nov. 20, at 7:30 p.m.
p.m., the film "Angel Levine"
will be shown in the JCC Lounge. , on Saturday night, Nov.
11 a.m., by Judi Bludworth. Tuesday or Friday at the JCC. 2 to 5 p.m. at the JCC. I On Thursday. Dec. 1, Dr.
the Consult Your Doctor Series. you have a problem, at 689-7700.
iut taste is a must. 1 wanted less tar. But not less taste. That Cigarette Smolung Is Oangerous to Your Health. our delights and our pleasures. and in ourselves as well. weakness led to new betrayal. know him or her in a caring way. and the life of your neighbors. him the entire Torah while! you. This is the essence, and the! fering a non- aggress ion pact. In December. 1973. Dr. M.
their pages in our faces." right to speak for us." enter talks with the Israelis. Saturday 8:30 a.m., 7:30 p.m.
Saturday at 9:30 0. m.
Saturday at 9 a. m. Blvd., North Palm Beoch, Fla.
Saturday ot 9 a. m.
[Holy Land- Since itB incep"
First Year Group 8 p.m.
B'nai B'rith Women Naomi -12:30 p.m.
Hadassah Palm Beach Tikvah -12:30 p.m.
Temple Emanu-EI Sisterhood -12:30 p.m.
B'nai B'rith Women Masada 8 p.m.
B'nai B'rith Women Medina to.m. B'nai B'rith Women Tzedakah 8 p.m.
Congregation Anshei Sholom -1 p.m.
Yiddish Culture Group -10 a.m.
01 Palm Beach County, Inc.
Temple Beth David Sisterhood -8 p.m.
Temple Beth El Men's Club Board -8 p.m.
Open House 2 to 4 p.m.
Carnival -9 a.m. to 6 p.m.
Carnival 9 a.m. to 6 p.m.
B'nai B'rith Women Boynton Board -1 p.m.
B'nai B'rith Women Naomi Board -1 p.m.
North Palm Beach -12:30 p.m.
Temple Beth El Executive 8 p.m.
Yiddish Culture Group 8 p.m.
JEWISH FEDERATION BOARD 8 p.m.
Women's American ORT Delray -12:30 p.m.
Book Review Series -1:30 p.m.
Israel Bonds Sponsors Evening -8 p.m.